Allium leafminer, a leafmining fly, was found about two weeks ago in Lancaster County, Pennsylvania. Since then the leafminer, which feeds on onions and related plants, has been found in four more counties in eastern Pennsylvania; Dauphin, Delaware, Chester, and Lehigh. This is the first time that this fly has been found in the western hemisphere. It belongs to the family Agromyzidae, which has many leafmining species. The allium leafminer feeds on plants belonging to the onion group, including, leeks, onion, chives, shallot, green onion and garlic. The adult flies are cold tolerant and emerge in late February and March when the female, after mating, will lay eggs in the leaves of the host plant. Upon hatching the larvae (maggots) will tunnel in the leaves eventually entering the bulb. Reaching maturity the larvae will pupate as brown capsules between the leaves, in the bulb, or in the soil nearby. They will go into a summer diapause with adult flies emerging in September and October to lay eggs. The second generation larvae will mine leaves and pupate until time for adult emergence in the following February. Adult flies are small, about 1/8th inch long, but have a yellowish-orange head and orange areas on the sides of the abdomen. 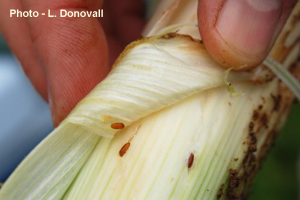 Cabbage and onion maggot flies may be active at the same time but are larger and are a uniform grey brown. Damage consists of weakened leaves and bulbs. Tunneling by the larvae allow entry for secondary disease pathogens. Damage is more likely to be a concern for organic farmers than conventional farmers. 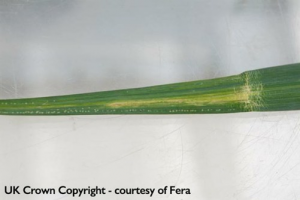 Several insecticides that are used to control other leafminers should provide control for the allium leafminer. 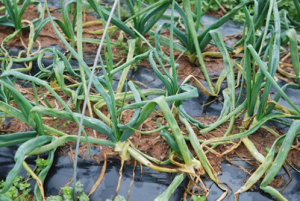 Row covers may help prevent new infestations especially for the fall crops.